Band/Glee Wow! 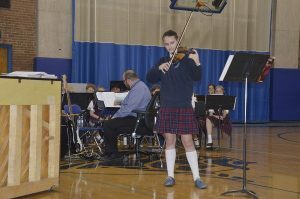 We have several talented musicians here at St. Hugo that performed for the school last week. Ania Petrosky is the best violin player I have ever heard play live. Josh Reid, and Maria VanDieren both played multiple instruments perfectly. The Glee Club was fantastic singing a number of fun upbeat songs. Great job to Mr. Pacifico, Ms. Calvaneso, and Mrs. Wygant for all of their work with our students! Screenagers: I know my kids got less screen time at home over the weekend after watching Screenagers this past week at school. Thank you to Dr. Quaine and her coordination with Mrs. Bartoli to show this documentary to our students and parents. It was an eye-opening experience! Tomorrow, Tuesday, May 22 is the Clap Out and final Mass for the eighth-grade students. Wednesday, May 23 Graduation 7:00 in the church. Wednesday, May 23 Parker Sabagh is “Principal for the Day”, she has given all students a free dress day. Thursday, May 24 last day to register for fall CYO sports register either Team Snap or hard copy going home today. Tuesday, June 5 is Field Day (Car riders 3:00 dismissal, bus 3:15), please consider volunteering if you can. The Sign-up Genius is linked. www.signupgenius.com/go/4090544a8a628a4fb6-sthugo.